Will Feeding the Homeless Become a Crime? The 90-year-old Arnold Abbott keeps on defying the law that restricts people of Fort Lauderdale, Florida from feeding their homeless neighbors. On October 22 the city passed a regulation that criminalized feeding the homeless at certain public locations. Should the elderly war veteran, a dedicated follower of Jesus, who has been feeding the homeless of his city for the past 23 years, now stop providing for the needy just because a recent regulation declared the noble charitable service a criminal activity? After all, didn’t Paul of the New Testament state, with painful clarity, that that true followers of Jesus must obey the governing authorities? Shouldn’t we believe that the authorities must have had some good reason, a serious public safety concern, or security and health issue that prompted them to restrict feeding the homeless in public? Shouldn’t Christians obey the laws of their countries whatever they demand? Adolf Hitler and his Nazi party used the same rationale to force almost the entire Christian church in Germany into submission. During the years of the II World War most German Christians comfortably ignored the plight of the Jews and the horror of concentration camps because they simply did what the law demanded – they only “followed the orders”. They were good citizens. Indeed, the followers of Jesus ought to be the law-abiding citizens. They ought to respect the authorities. They ought to live in harmony with the law of the land. They are certainly not the ones who are eagerly looking for the opportunities to defy the law or provoke the actions of civil disobedience. But when the laws are enforced that dehumanize our neighbors, or take away whatever is left from the dignity of those who are forgotten, ignored and marginalized, the followers of Jesus cannot hide behind their law-abiding status. They are left with no choice but to respond in a manner of Peter and John who addressed the authorities of their days: “Judge for yourselves whether it is right in God’s sight to obey you rather than God.” Acts 4:19. And this is precisely what Arnold Abbott from Fort Lauderdale is doing when he feeds the hungry despite the new regulations that demand otherwise. Laws of our countries, states and cities are not gods. Neither are the legislators. When the laws are put in place that suppress the pursuit of justice and fairness, or trample on the God-given, unalienable rights to the life with basic human dignity; or when the laws control people through the denial of their basic needs, followers of Jesus are often left with no other choice but to defy such laws. The followers of Jesus are law-abiding citizens not because the laws of the country are their final authority in all matters of their conduct, but because they expect them to reflect, imperfectly though, the character of their highest authority – the law of Christ. In one of His parables Jesus stated with the unmistaken clarity what is expected from those who follow Christ ahead of the government: “I was hungry and you gave me something to eat, I was thirsty and you gave me something to drink, I was a stranger and you invited me in, I needed clothes and you clothed me, I was sick and you looked after me, I was in prison and you came to visit me. Whatever you did for one of the least of these brothers of mine, you did for me.” Matthew 25:35.36.40. Any decent law, rooted in the principles that govern a democratic society, should also reflect fairly the principles of Jesus. The acts of defiance of the 90-year-old Arnold Abbott, however minor and symbolic in nature, remind us that this is not often the case. They remind us also that Jesus did not call his followers to act justly and with compassion only if and when such actions are approved by the earthly governments. Nor will Jesus, on the day when He calls us to give an account for our choices, ask if our governments allowed us to be little Jesus’ to other people. The pursuit of goodness is not a matter of legislation, laws and ordinances, but of the conscience governed by the Holy Spirit. The situation in Fort Lauderdale, Florida is a warning. This is not the first instance that a local government is trying to obstruct the service of people of faith to their underprivileged fellow men and women. Since January 2013 more than 20 similar legislations have been passed in the US, and at least ten more are under construction. 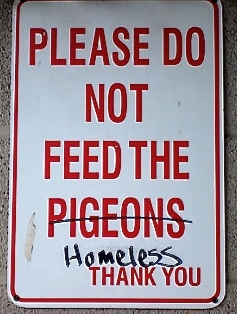 In Houston, for example, groups feeding the homeless face a fine if they are feeding the poor without a written approval, while in Columbia they have to pay $ 150 for a permit to feed the homeless in city parks. Every year it is becoming somewhat harder to feed the homeless in the US. Knowing all that the 90-year-old Arnold Abbott decided to make a statement by defying an unjust ordinance: he would continue to feed the hungry whatever the cost. He would, according to Peter and John, rather “obey God than men”. This entry was posted in Faith and tagged Adolf Hitler, Arnold Abbott, Crime, defiance, Feeding the homeless, feeding the hungry, following the orders, Fort Lauderdale, Government, Homeless, Homeless USA, homelessness, Human dignity, Human Rights, Injustice, Law, Matthew 25:35-40., serving the poor, The Hungry. Bookmark the permalink. 1 Response to Will Feeding the Homeless Become a Crime? ‪http://youtu.be/o9B7MOqZe3M‪ Recommended video about the ministry of Arnold Abbott.